Enter the Thermage and Fraxel BFF contest! 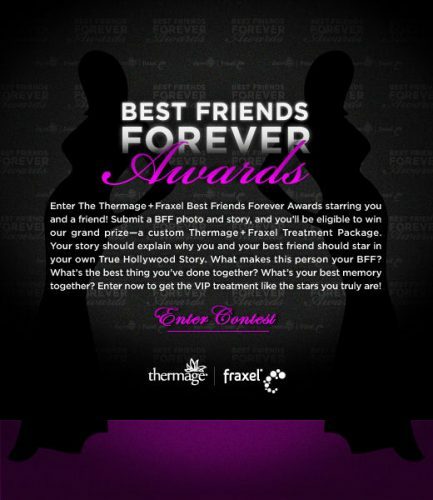 Enter to win Thermage and Fraxel treatments for you and your best friend for great looking skin! Thermage uses radio frequencies to help tighten and contour skin and helps stimulate new collagen to grow. Fraxel is a laser that resurfaces aging and sun-damaged skin, smoothing out the skin’s surface and erasing unwanted brown spots and wrinkles. When used together, Thermage and Fraxel are safe and effective ways to maintain a youthful looking appearance – all without the risks, discomfort, and prolonged downtime of more invasive procedures. -Visit the Thermage + Fraxel Facebook page HERE. -Submit a photo and story about you and your best friend to become eligible to win a custom Thermage and Fraxel treatment package worth $5,000. -In addition to the grand prize, each contest entrant may enter to win the weekly prize – a $100 Sephora gift card. -Four sets of winners will be selected based on stories they submit via Facebook, including what makes this person your best friend and your favorite memories together. -Contest ends June 21, 2010.